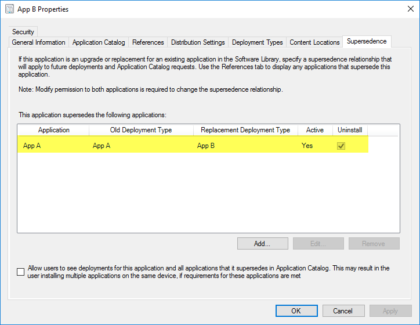 When updating Applications to a newer Version in ConfigMgr, you often need to deal with Restarts after a successful Installation. 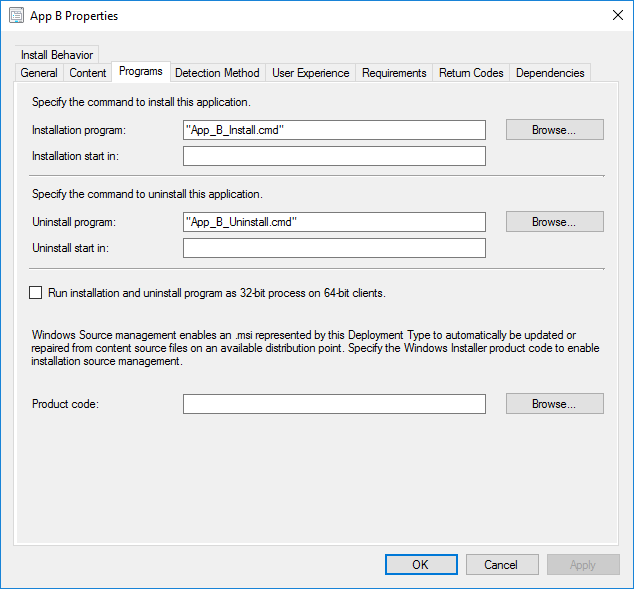 This is mostly handled completely automatically by the Installer terminating with a common exit code (e.g. 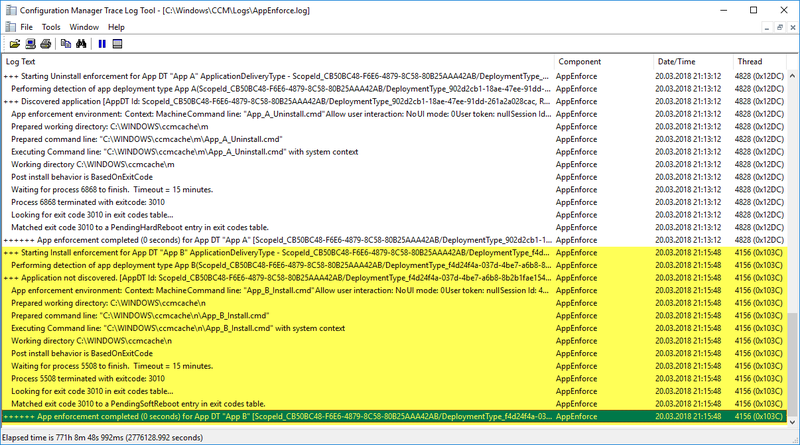 3010), which is telling the ConfigMgr Client to prompt for a Restart. 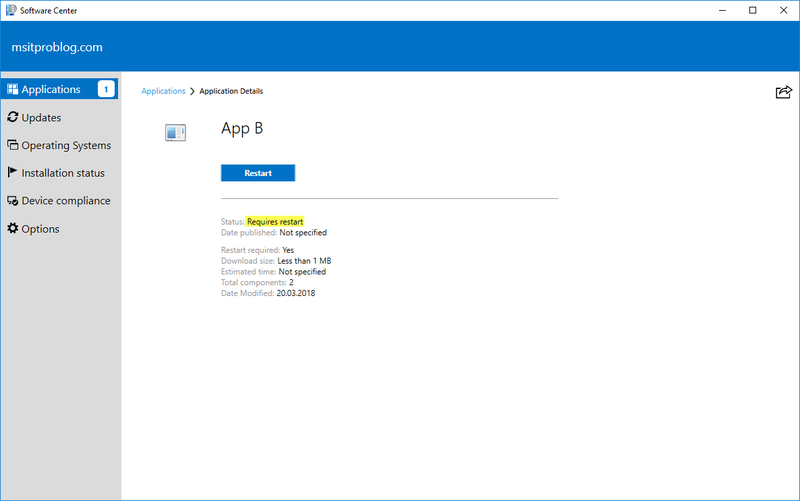 For the sake of this blog post, I created two Dummy Applications, which are called App A and App B. 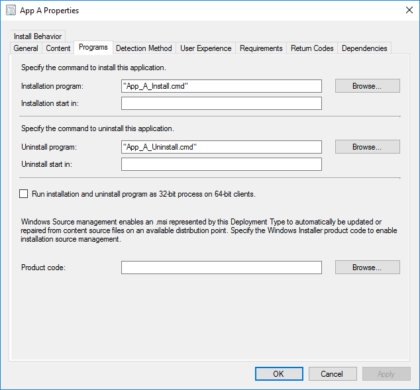 Both Applications have an Installer and an Uninstaller, that terminates with an exit code 3010. This pretty much reflects the real Situation that I had. 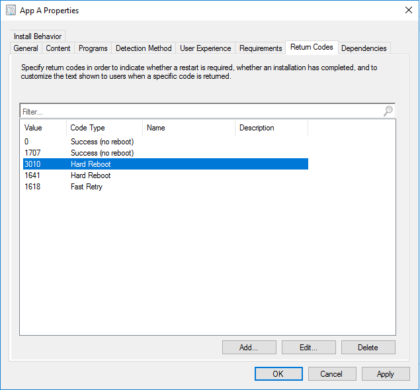 Additionally, on App B there is a Supersedence configured, that forces an Uninstallation of App A.
App A was successfully uninstalled and terminated with an exit code 3010. 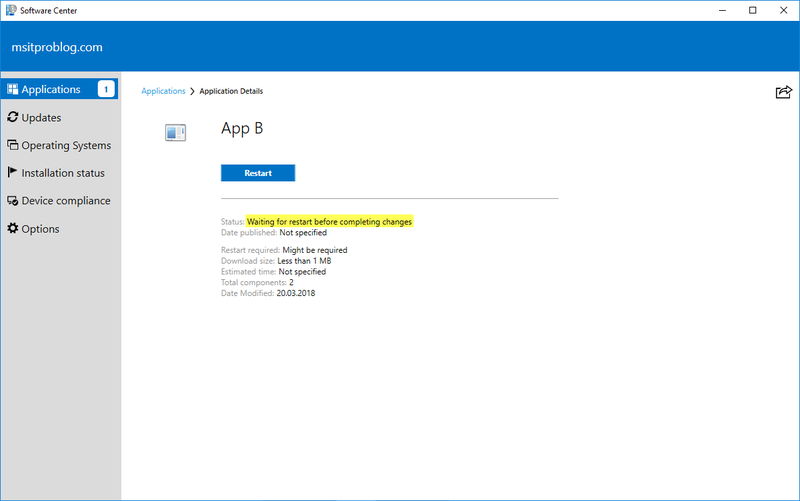 However, the ConfigMgr Client ignores the PendingSoftReboot here and just continues with the Installation of App B. The Installer of App B also terminates with an Exit Code 3010, which finally triggers a Restart Notification in Software Center. So, the expected result here wasn’t really what I thought it would be. To get our additional Restart in the Update Process, we need to Modify the Return Code Table of App A. 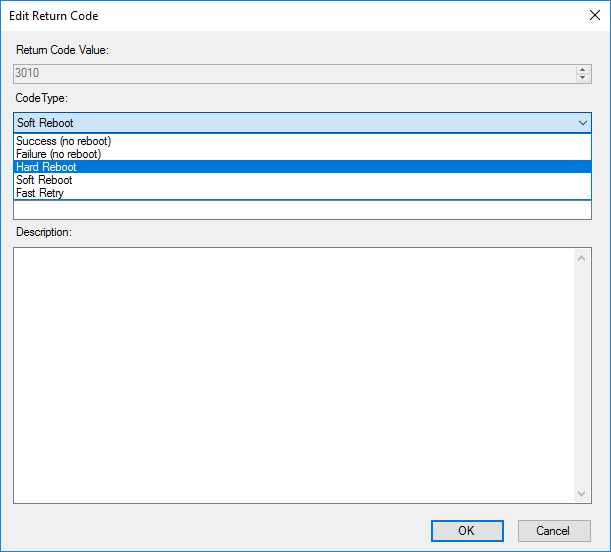 Below you see the unmodified Return Codes table that you get when creating a new Deployment Type. 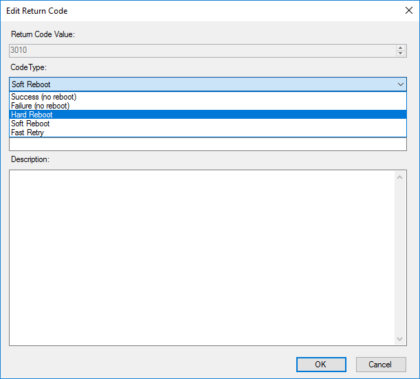 As we saw in AppEnforce.log, the common exit code 3010 means Soft Reboot. For this to work, we need to change the Code type from Soft Reboot to Hard Reboot. With this configured, we can run the same Test again as above. Now, the Update Process will stop after the Uninstallation of App A with a PendingHardReboot instead of a PendingSoftReboot. Software Center will now prompt the User to perform a Reboot. Additionally, Software Center will now show the Status “Waiting for restart before completing changes”. 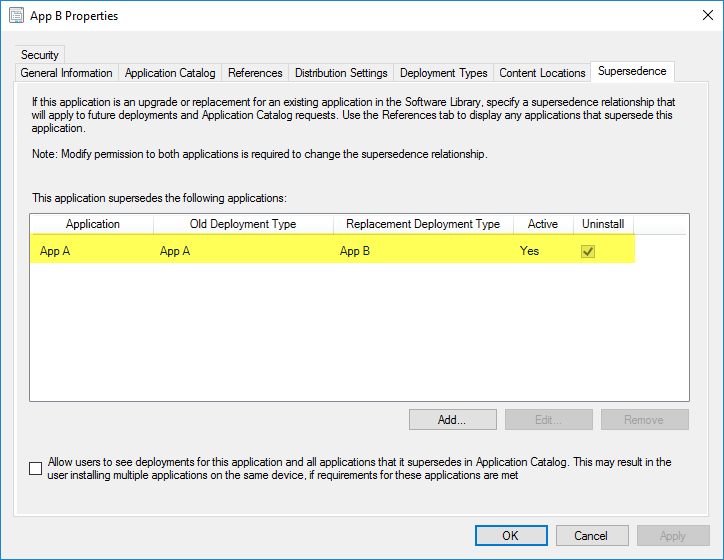 After the Restart, the ConfigMgr Client will continue with the Installation of App B. The Installer of App B will now terminate with a PendingSoftReboot as before, which will trigger again a Restart Notification in Software Center. I am having a similar issue to dj3094. I have my 2 apps set up almost exactly the same way as you described however application B is not installing after the reboot triggered by the uninstall of application A. Any help is appreciated.